Congrats to Samantha & Brandon on their engagement and soon to be wedding. 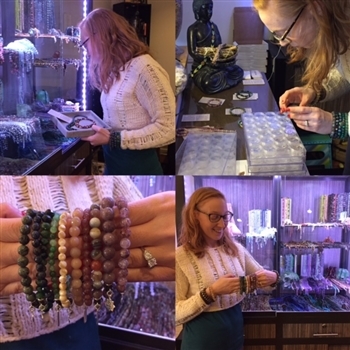 Here you see Sam carefully choosing gemstones for her bridal party. She chose a different stone and a different charm depending on the energy she wants for each women. Lucky ladies - lots of love and positive vibes went into designing these special gifts.